Melbourne is a perfect city for the inquisitive traveller. This coastal capital of Victoria is easy to navigate and offers visitors lots of surprises. When you visit Melbourne, you won’t just love its cosmopolitan atmosphere, but you will also enjoy its vibrant art scene and the charming backstreets. There are many hidden treasures that are awaiting to be discovered, such as a Great Ocean Road road trip, where you can hire a car and explore Australia’s most stunning coastline and towns. This Great Ocean Road self drive route extends over 200 kilometres and is visited by over 7 million tourists a year. Our Melbourne travel tips for budget travellers: there is a free shuttle bus that runs around the city and its inner suburbs from 10 in the morning to 4 in the afternoon. If you wish to take a Melbourne trip on the city circle trams, these are also free from 10 in the morning to 6 in the evening and run every ten minutes. Tip: Download the Great Ocean Road maps to your smartphone and save them as image. You can always use them offline whenever you need to. Melbourne City is located in the southern state of Victoria and is the second largest city in Australia after Sydney. As Melbourne and the Great Ocean Road are the coldest places in southern Australia during winter, they should be visited before winter holidays begin. You can, of course, take a Great Ocean Road tour or Melbourne trip in winter, but remember to wear a thick jacket! On the day of your arrival in Melbourne, you should take a good look at the starting point of your route. Our plane landed relatively late, but we still took the 160 km drive to Colac in Victoria Melbourne and stayed there. Alternatively, you can go further in the direction of Peterborough and look for a place to stay there. On the second day, the actual route starts from the Great Ocean Road. Tip: Getting up early in the morning is well worth it as the limestone cliffs along the Great Ocean Road route look especially good at sunrise and there is plenty to see! The first stop is called London Bridge or London Arch in Port Campbell National Park. The erosive power of the sea has created a natural bridge that’s reminiscent of London Bridge. The next stop on your Great Ocean Road itinerary is the Loch Ard Gorge. The gorge is named after the clipper, Loch Ard, which sank in the fog near Muttonbird Island. Today, only two rock columns remain from the natural, stone arch (Archway Island), which was named by the two survivors of the ship catastrophe, Tom and Eva. You can go down to the beach and take a little stroll along the coast and explore these unique views. Afterwards, it is only 7 km to reach the twelve apostles in Australia or rather "8 Apostles", because there are only 8 limestone cliffs remaining. Since there is a lot planned for this day, one should not stay too long despite the uniqueness of the site. 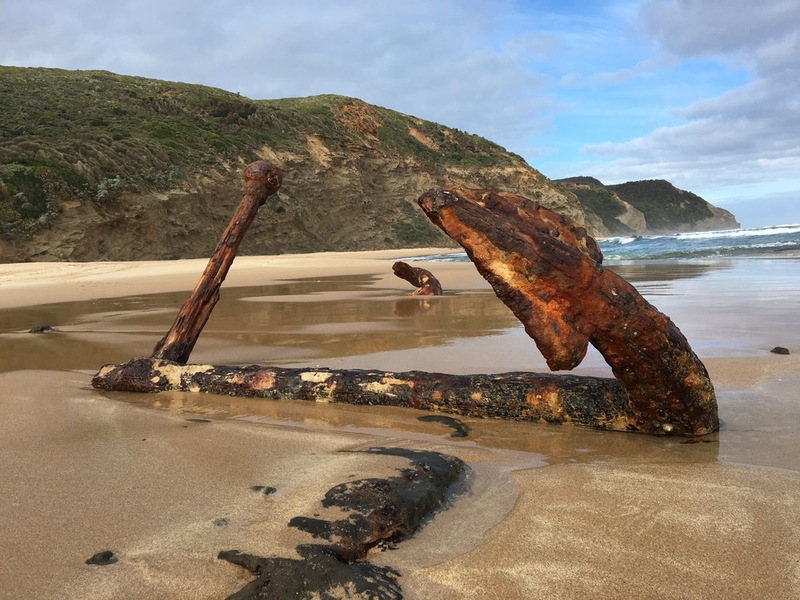 The next stop in your Great Ocean Road trip includes a visit to Wreck Beach, where the anchorages of the shipwrecks, Marie Gabrielle (1870) and Fiji (1890) are embedded in the reef and visible at low tide. The anchours can be found a few hundred metres on the right side of the beach after climbing about 400 steps from the car park to the beach. You should plan to spend around one hour at this site including your stay at the anchour and the beach. After Wreck Beach go towards Cape Otway. On the way from the main road in the direction of the lighthouse, you will see koalas. Just stop the car and look out for them; we saw plenty of koalas along the road. In addition to koalas you can also see kangaroos at dusk. After a short stay at the lighthouse we headed towards Apollo Bay. Apollo Bay is a small fishing village with vast, white sand beaches. You should not stay too long here as the day will slowly come to an end and you should still enjoy the natural light for the beautiful views of Lorne Great Ocean Road. In Lorne, we recommend that you spend the night to end the day comfortably. From Lorne, head towards the coast to reach the Split Point lighthouse. From this lighthouse, you will have a beautiful view of the coast and the sea. Here you should definitely have a coffee or even breakfast in the small enchanting cafe at the lighthouse. Afterwards, head to Bells Beach, Australia's best known surfer beach with huge waves. Bells Beach is home to the world's longest-running surfing competition - the Rip Curl Pro Surf & Music Festival. Next, visit the surfer village of Torquay, home of surfers contests, Rip Curl and Quicksilver. A little shopping opportunity in one of the surfer shops should not be missed. From Torquay we continue to Queenscliff and from Queenscliff take the ferry to Sorrento. Our last stop is the Penguin Parade on Philip Island. If you don’t want to take the ferry, you can also take the alternative route via Geelong by car, although the ferry crossing is much nicer. A little warning about the Penguin Parade: It is very touristy and professionally put together. There are tons of different tickets and upgrades. Our experience was that it was not worth buying the most expensive tickets! The best way to see the penguins is when they waddle from the sea to their burrows. No matter what type of ticket you have bought, you will still see them all waddle from the sea. Today we head to Sovereign Hill. Just like all the other days, you should also get up early in the morning to see all the highlights. 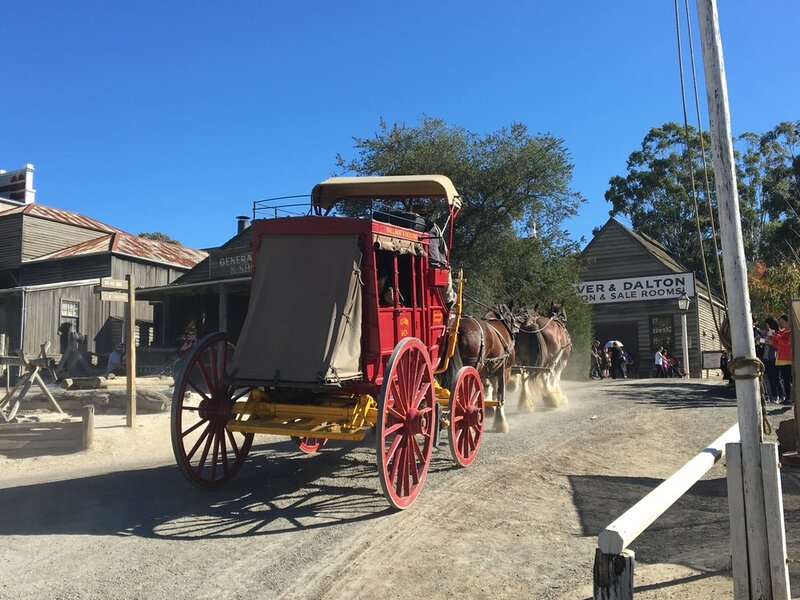 Sovereign Hill is a museum city that represents the gold rush era in Australia. The whole city is built to look like a gold mining town. 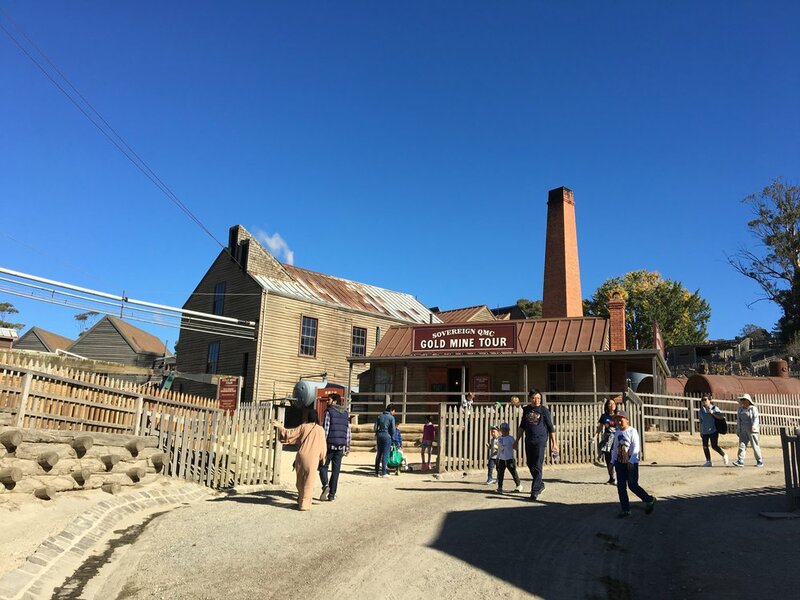 You can even try your luck with gold panning, take a stroll through the shops, or participate in a guided tour of an underground gold mine in Sovereign Hill. To take part, you need to buy the tickets from the ticket kiosk in front of the mine within the open air museum of Sovereign Hill. There is also a small gold museum that you can visit whilst you are there. Afterwards, head back to Melbourne for the famous, colourful beach huts in Brighton. If you still feel like spending more time there, stroll around St. Kilda along Acland Street and Esplanade, or see the 1912 Luna Park, the historic amusement park. The day starts in the morning at the Queen Victoria market. As it is the last day of our trip, it’s best to thoroughly explore Australia's culture capital, Melbourne. Being the capital of Victoria Melbourne is Australia's second-largest city and not only does it have a touch of European flair, but it is also an international cultural centre, with many major cultural events and festivals. The Queen Victoria Market is a 130-year-old food market that everyone in Melbourne loves. One should not miss the historic truck, where fresh doughnuts are baked. 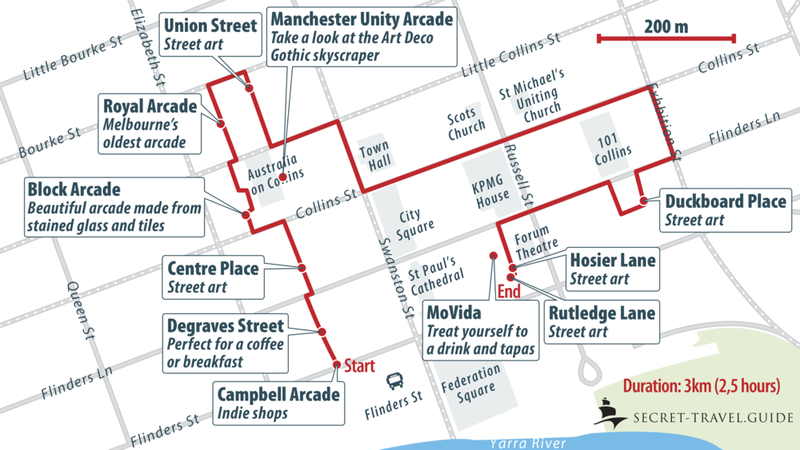 Those who want to discover as many Melbourne city attractions as possible should not miss the tour of its alleys and arcades (see map). 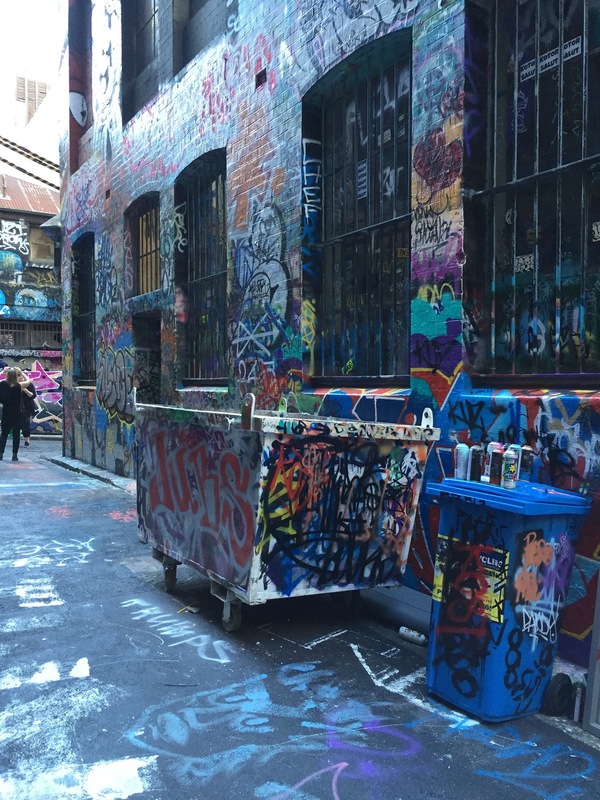 The tour takes you through Melbourne's beautiful arcades and streets with street art. The tour takes about 2 - 3 hours, depending on how much time you want to spend in the arcades. If you need a little break afterwards, you can join a leisurely boat tour along Yarra River. Most tours start from under Princes Bridge, behind Federation Square. After the boat tour you should see the most photographed building in Melbourne, Flinders Street Railway Station and Federation Square. Depending on how much time is left, you can visit one of the many museums. Alternatively, you can also see "The Shrine of Remembrance", an Anzac war memorial. What are the best places to visit in Melbourne? Some of the best Melbourne attractions include the Royal Botanic Gardens, which were established in 1846 and extend to the south of Yarra River. This green parkland encompasses two locations: Cranbourne and Melbourne. The other top Melbourne tourist attractions are the memorial museums and the gold mining village, where you can pan for gold. 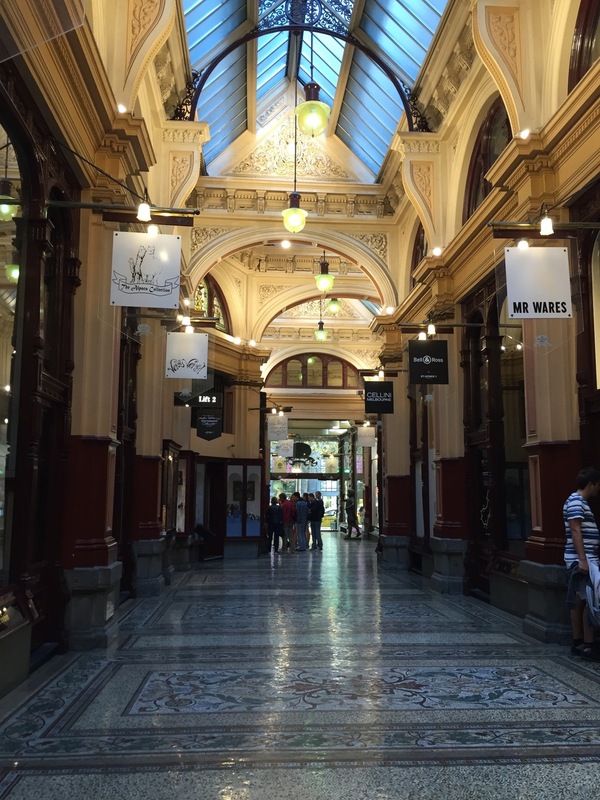 The historic Queen Victoria Market is a must-see along with the artistic street art that you will find in the backstreets. A leisurely boat tour along Yarra River should also not go amiss, where you can capture beautiful photos of the city's scenery. How do I travel Melbourne alone? Melbourne is a great city for a solo traveller. This is the perfect place for exploring culture, music, and street art. Every solo traveller should go on at least one tour and meet other like-minded people along the trip. Whether you choose to see the 12 Apostles, sample wine in the Yarra Valley, or visit the penguins in Phillip Island, there is always something to do to in this beautiful city. How to travel around Melbourne? To get around Melbourne, all visitors should buy a travel card in order to use public transport (trains, buses, and trams). The City Circle Tram is free but you will still need a travel card if you wish to travel to the city’s outer suburbs. The Visitor Shuttle is one of the best ways to explore the inner city and you can choose to hop on at any of the 13 stops along the way. This shuttle service runs every half an hour and will take you to shopping arcades, parks, sports stadiums, and more. A full trip will take 90 minutes and tickets can be bought online or the Melbourne Visitor Centre. How do I travel from Melbourne to Sydney? The fastest way is to catch a flight otherwise you will have to drive for at least 8 hours on the motorway. You won’t have to spend long hours driving a car when there are cheap airlines that will fly you there within 1 hour. Can I travel from Melbourne to Sydney by train? Yes, but it will take you around 11 hours to get there. The trains are old (from early 1980) and the maximum speed they can go is 160 km per hour due to track conditions. Most of these trains depart early in the evening and arrive to Sydney’s centre early in the morning. We would recommend taking a flight to Sydney as you can still get a good view from the air plus there won’t be any flight departure delays unlike the trains. How to travel from Melbourne to Tasmania? Tasmania is Australia’s only island state so it can be accessed by either air or sea only. There are regular flights from Melbourne, Brisbane, and Sydney that fly direct to Hobart, Flinders Island, Devonport, and Launceston. You can also take the Melbourne Devonport ferry to Tasmania. There is currently one ferry operating up to 6 times a week with duration of 9.5 hours. The Great Ocean Road is a listed National Heritage and stretches 243 kilometres along south-east coast of Australia between the cities of Allansford and Torquay. Where does the Great Ocean Road start from? The Great Ocean Road begins from the city of Torquay all the way to Allansford. This 243-kilometre road has two lanes (for each direction) and the maximum speed limit is 100 km per hour. Is the Great Ocean Road in Melbourne? It is a 3 hour drive from Melbourne. What are the best Great Ocean Road stops? As you take a Great Ocean drive, you will find one of Melbourne’s most popular holiday destination; the stylish town of Lorne. This place is home to Qdos Arts and many cultural activities that take place every spring. Just a short drive away from Kennett River, you can also find a lush rainforest at the Great Otway National Park. If you have a little time to spare, take a hike through the moss-covered trees in the rainforest or drive for one hour to reach the Triplet Falls. 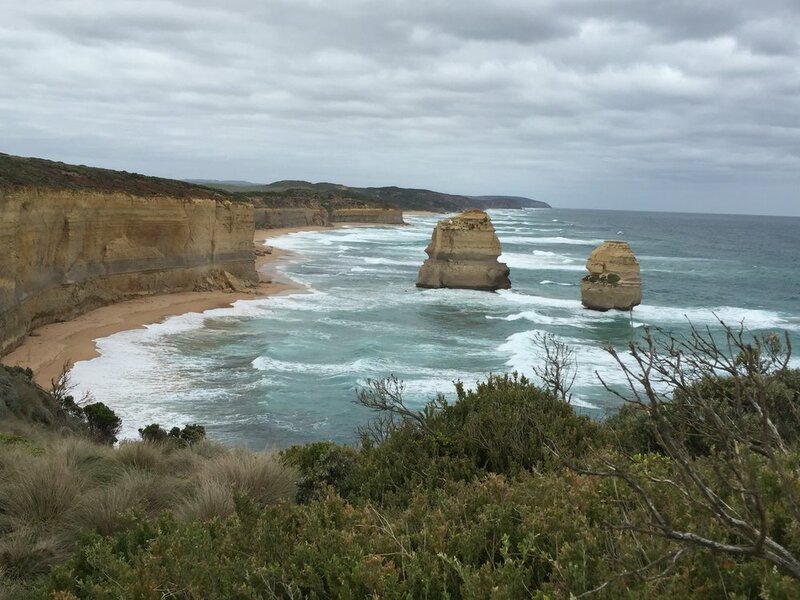 The other highlights include: 12 Apostles, Bells Beach,Cape Otway Lighthouse, London Bridge, Surfer Village, Wreck Beach, and Loch Ard Gorge, among others. What are the Great Ocean Road highlights and must-dos? 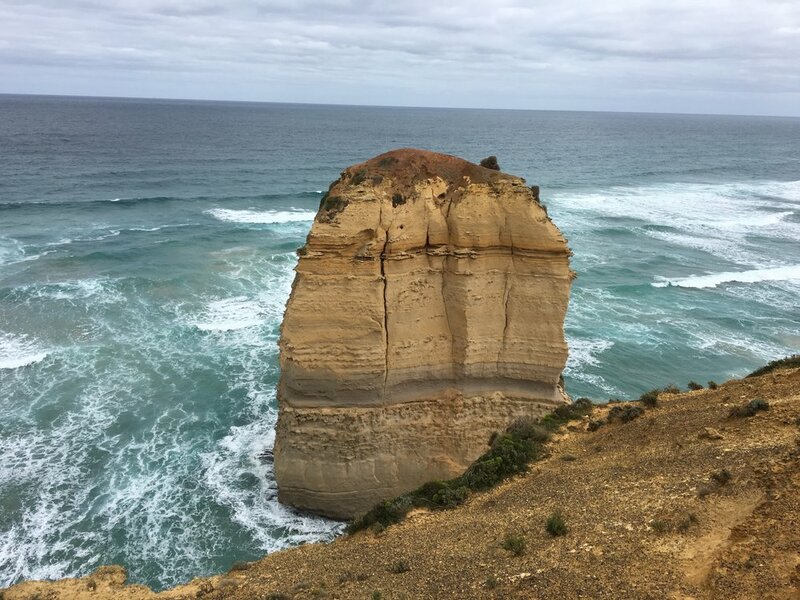 The Melbourne Great Ocean Road tour has many highlights that include: Gibson Steps, 12 Apostles, Loch Ard Gorge, London Arch, Bay of Islands, Port Campbell National Park, Bells Beach, Apollo Bay, among others. This road was a permanent war memorial to the soldiers who died during World War I. It was built by the surviving servicemen who had survived the war. Although the initial construction plans were submitted by Calder during 1800s, it was actually Geelong mayor Alderman H. Hitchcock who raised the needed funds to finance the project. Hitchcock took this opportunity to employ the returned soldiers for building the road and creating a lasting memorial to all those who had been killed in the war. Where can I surf in the Great Ocean Road? This region has some of the world’s best surfing spots. Bells Beach in Victoria is internationally renowned and home to the annual Rip Curl event. If you are a beginner surfer, you can always take surfing lessons, which are held by qualified instructors in east of Apollo Bay. When is the best time to go to Great Ocean Road? In winter, which is from June to August. This is when the weather is gentler to the ocean winds. Winter also offers clearer skies that are perfect for sunset watching. This is the perfect season for whale watching during your road trip and the best thing is, it’s not congested with traffic and tourists so accommodation prices will be lower. However, temperatures can drop significantly as weather conditions in the Great Ocean Road are influenced by the Southern Ocean and there can even be snow in the Otways and Victoria. Another great time to visit this part of Australia is in autumn (March-April) as accommodations are cheaper and there are less tourists. How many days do I need to explore the Great Ocean Drive? 4 to 6 days would be sufficient to explore the entire Great Ocean Road and its surroundings. How to tour the Great Ocean Drive? Best to hire a car or campervan. Tours start from Melbourne. Is driving on the Great Ocean Road dangerous? Driving on the Great Ocean Road is safe, however, you should look out for the kangaroos or other animals that are normally active after dark and drive slowly. I want to stay overnight, are there any great ocean road accommodation offers? You can treat yourself to a little luxury and spend a night or two in one of the first-class hotels along the coastline. These hotels are within easy access to all the major sites and attractions. Alternatively, if you’re on a tight budget, you can relax in a self-contained beach hut in one of the villages nearby or hire a room in a B&B. Regardless of whether you are seeking a luxury or budget accommodation, you will find what you need in the Great Ocean Road region.